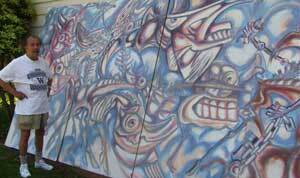 Emilio Aguayo is one of the pioneering Chicano/a muralists in Washington State. His empowering Chicano/a mural at the Ethnic Cultural Center, Somos Aztlan, was the first Chicano Movement mural in Washington state. It emphasizes Chicano/a self-determination and cultural pride. While Aguayo wrote and painted murals, he also engaged in Vietnam-war protests at the UW and worked as a recruiter for the Office of Minority Affairs, Chicano Division. He recruited several Chicano/a students from local public high schools and from out of state, with the goal of bringing Mexican-Americans, who had historically been excluded from universities, to the University of Washington. He was also a member of the Chicano/a activist theater group, El Teatro de Piojo, for which he designed the theater logo. Aguayo was also heavily involved in the United Farm Worker’s (UFW) movement in the Seattle area, attending strikes and boycotts to achieve improved wages and working conditions for farmers in the Yakima Valley. He fought for farm worker bills with Lupe Gamboa at the state Senate and was a member of a branch of Cesar Chavez’ union in the Yakima Valley. In the 1970s, Aguayo was a strike organizer at the Gamache hop ranches. He also walked the picket lines on the Borlotte ranches and the Little and Big Chief Yakima ranches. Always involved in the strike lines with the rank and file, he met Cesar Chavez and supported UFW efforts in any way he could. Aguayo helped to support La Escuelita in Granger, providing an education to the children of farm laborers. ln 1974, Aguayo earned his M.A. in education at Oregon State. He continued working counseling students. Today, he continues to make his art and has only the fondest of memories of his community organizing experiences at the UW. Emilio Aguayo shared memories of his life, activism, and artwork in a videotaped interview conducted by Oscar Rosales Casteñada, May 25, 2008. Video editing by Maria Quintana. 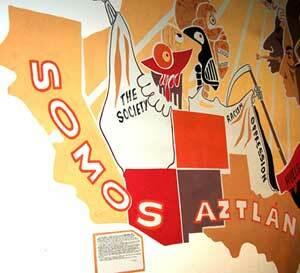 Emilio Aguayo, _Somos Aztlan, _wall mural at the Ethnic Cultural Center, Seattle. _The Five Horsemen of the Apocalypse-Enemies of my People_ or Los Cinco Caballeros de Apocalypsis-Enemigos de Mi Gente (1977),painted for the Active Mexicanos multi-service center in Seattle via a Seattle Arts Commission grant. Wall Mural in Lander Hall, University of Washington.